Tom Holland grew up in San Mateo, California, and attended San Mateo High School. Upon graduation he went to Willamette University in Salem, Oregon, where he was mentored by Mark Hatfield who was then the Dean of Men. When Hatfield entered politics, he hired Holland to drive him to campaigning locations. It was while waiting in the car during Hatfield's public appearances that Holland began painting watercolors. Holland began to focus seriously on a career in painting while at Willamette, and he subsequently transferred to the University of California, Berkeley. It was at Cal in the art department that Holland began his formal art education, where he was strongly influenced by David Park who was a member of the art faculty. Other artists, among them Richard Diebenkorn and Elmer Bischoff, working at this time in Berkeley, contributed to the development of Holland's artistic and personal style as a young student. Following his time at Cal, he travelled to Santiago, Chile, as a Fulbright Grant recipient. His beginning as a painter was labeled "funky". He had his first one man show with the Lanyon Gallery, in the Stanford area south of San Francisco, and it was at that first gallery that he met two students who were to have a tremendous influence on his career. Charles Cowles bought one of Holland's paintings while still a student at Stanford and went on to become Holland's art dealer for over 20 years in New York City. 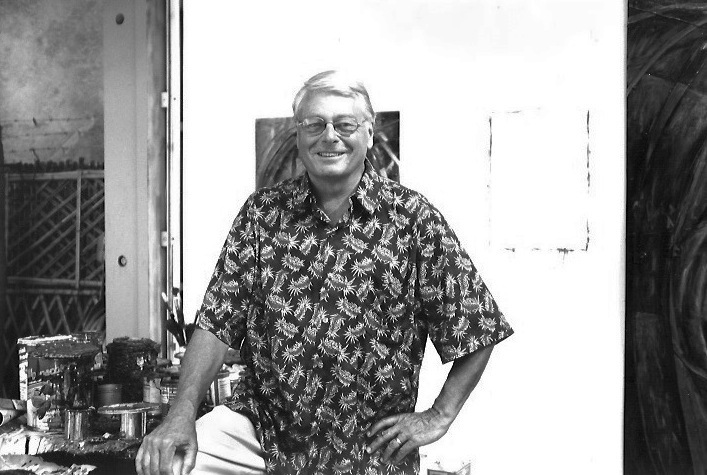 Another student, Nicholas Wilder, came to work at Lanyon Gallery and went on to become an acclaimed art expert and gallery owner on La Cienega Boulevard in Los Angeles during the boom years of the 60's and 70's. Although his early work was traditional oil on canvas, it was when Holland began to work with aluminum during his early years teaching at UCLA in Los Angeles that he really achieved critical acclaim. In the 70's Holland began using materials that were light and strong but did not require a frame. Using fiberglass and aluminum, making pieces of color which hang on the wall like stiff tapestry, the thin edges allow Holland's paintings to become a part of the space occupied. Using simple materials and a unique approach combining paint and sculpture, he cuts thin sheets of aluminum or fiberglass to build either a painting or free standing form. He rivets the cut pieces to a single sheet and then, after applying a white base coat, he uses epoxy paint to achieve the effects of depth, light, reflection and shadow. He works alone, without assistance, in his downtown Berkeley studio, as well as in his country studio. Holland considers the landscape and his attachment to the natural world to be the basis and constant inspiration for his long career of over 50 years as a California painter. His work has been described as taking inspiration from Cubism, Futurism, and Constructivism, and he has been called one of California's most important contemporary artists and was featured in Art in the San Francisco Bay Area, 1945–1980: An Illustrated History. His work has been labeled exhilarating and visually challenging, playing games and distorting the three dimensional space. In addition to developing his own work, Holland has also served as a faculty member at the San Francisco Art Institute, UCLA, and UC Berkeley. He retired from teaching in order to paint full time in his downtown Berkeley studio. He frequently speaks about his work and his career to university classes, museum groups and arts clubs, collectors of contemporary art, art students and arts faculty. He also opens his studio to students, museum groups and collectors for visits and discussions upon request. Beyond his larger sculptural pieces, Holland occasionally cuts and bends paper, fiberglass or aluminum to make small figures such as heads or animals which are playful exercises with color, form and materials. He contracts with a potter to make ceramic plates which he paints using images inspired by the landscape and has done a series of paintings often etching on thin copper sheets. His work was chosen by John Elderfield of the Museum of Modern Art in New York City for a show of work on paper which encouraged Holland to continue exercising this creative form. He also makes lithographs and has made prints with Cirrus Editions, Nuristani Prints and Crown Point Press. He works on marble, copper, paper, and clay and uses watercolor, acrylic urethane and ceramic glazes. Holland is currently represented by galleries in Dallas, Santa Fe and San Francisco and his prints are with Crown Point Press in San Francisco and Cirrus Editions in Los Angeles.